When you’re looking for a rug that’s made out of something original and unique but you aren’t sure what you’re looking for, be sure to browse through other material rugs that don’t necessarily fit into different labels or sections. These rugs may be made from a wide variety of different materials, and the right rug for you could be designed from something you never thought possible. Although these types of rugs have a place in just about any style of room, they are especially nice in contemporary, modern spaces that need a little burst of originality to make them stand out even more. 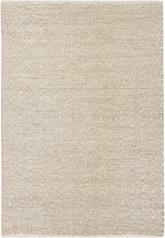 What are Other Material Area Rugs? 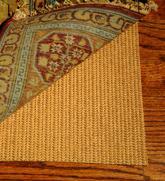 Traditional rug materials are more or less divided into two areas: manmade fibers and natural fibers. Manmade fibers include nylon, polyester, polypropylene, acrylic, and various synthetic blends, while natural fibers include wool, silk, sisal, jute, hemp, and seagrass. However, there are always a few types of rugs that simply don’t fit into either one of these categories, and these are usually labeled “other.” Although there are a few different types of other material area rugs you can expect to find, many of them are made of Chindi fabric. Chindi area rugs are a type of recycled material rugs that are usually made from torn, cut or shredded pieces of 100% cotton that come from other rugs and other purposes. They may also be called “rag rugs,” and for the most part, this is a pretty good way to think of them. Most of the time, these are handmade rugs that are either looped or woven by individuals who tie the pieces of cotton together to create fluffy, comfortable, very soft decorate rugs. They are usually found in multicolored rainbow designs that have no real set pattern because they rely on the availability of individual pieces of torn cotton. Just because your rug is made of other materials than those you might ordinarily look at doesn’t mean you necessarily have to limit yourself to one size over another. You can find rugs made of unique materials in just about any size you can imagine, and you can use them in much the same way that you would incorporate traditional rug materials into your home décor. For example, with these materials, larger rugs still look great in certain rooms while smaller rugs can make excellent accent pieces throughout your home. Just remember that big 10x12 or 8x10 rugs are going to be multicolored as well, and they may look a little haphazard for some living rooms. If you want to use the colors and textures found in these rugs without relying on the hefty visual weight of a large rug, you can select a few 4x6 or 6x8 rectangle rugs to throw around your living room instead. These smaller rugs can help you add a splash of color in a few parts of the room while still dividing the space visually a little bit more. Go smaller and choose a 4’ round or a 2x8 runner rug for other rooms in your home, such as the bedroom, hallway, or entryway. What Shapes of Other Material Rugs are Available? Soft rug material may be a little more difficult to form into several different shapes than other types of material you might be looking at. Some rugs hold up to various shapes a little better than others, and when it comes to these “rag rugs,” you’re more likely to find them in rectangles and squares than any other shape. However, you won’t be at a loss for runner rugs when looking at this material, either, and you’ll even have the option of working with round rugs if you so prefer. 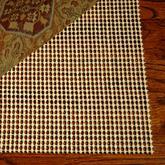 Rag rugs look best when you choose a runner or larger rectangular rug, however. Because of their multicolored design and the frequent use of tassels in these rugs, they look amazing when you stick to the traditional shape of most area rugs. This can help you balance the uniqueness and originality of the material with something a little more familiar. Even with a rectangular rug, you should have no trouble putting together a casual, contemporary space with ease. What is the Best Room for Using Other Material Rugs? While you might be tempted to use one of these very unique and beautiful rugs in every room of your home, remember that some spaces are more inclined to work well with these rugs than others. For example, while you can certainly use one in your living room or dining room, you might want to choose another material for these high traffic area of your home. 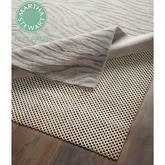 Select a material that won’t become too severely damaged when your kids and pets inevitably walk across it every day. Rag rugs may pull and tear over time, and they can be difficult to clean depending on the way in which they’re made. However, if you do want to use these rugs in your living or dining room, stick to the smaller ones. Smaller rag rugs can also look great in your bedroom, and this can also be a good place to incorporate a larger other material rug into your décor. Spread a 10’ wide rug beneath your bed and be sure to offset it so you can step out of bed onto one of these soft, comfortable, extra plush rugs every morning when it’s time to start your day. They make great additions to kids’ rooms, too! Now that you’ve learned a little bit about rugs made of other, unique materials, you might be ready to decorate your whole home with several of these beautiful pieces. Remember that these rugs are designed with the material in mind first and foremost, and that they might not always be the best choice for certain rooms in your home. However, if you’re willing to work around any potential issues you might have with specific types of materials you might choose, then a rug made of non-traditional materials can be an excellent addition to any room in your home.